The artificial arrangement of the premaxillary teeth projecting away from the jaws, due to captive conditions, can be seen from this photograph. 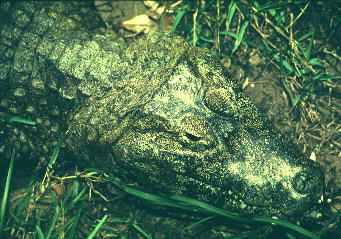 The head of the Yacare caiman is relatively short compared with other caimans. Perhaps this is influenced by the same factors (e.g. diet) as those which affect Caiman latirostris, another broad-snouted species which overlaps the range of the Yacare caiman.